The 12 examples in the course develops your ear training skills so that you can hear complicated harmony in one key center. Many times students have a hard time separating out multiple voices with a chord. This course gets right to the heart of the problem and has you sing these inner parts. Each of the four parts are not that hard to sing for most students but developing the skill to stay on your part with one or more other voices is usually quite challenging for students. Most students need work on hearing a key center when more complicated chords are used. This course helps you conquer this problem with progressions that get more and more challenging. Singing simple two or three part harmony on the spot is a skill that most musicians desire. This course will have you singing harmony in no time. 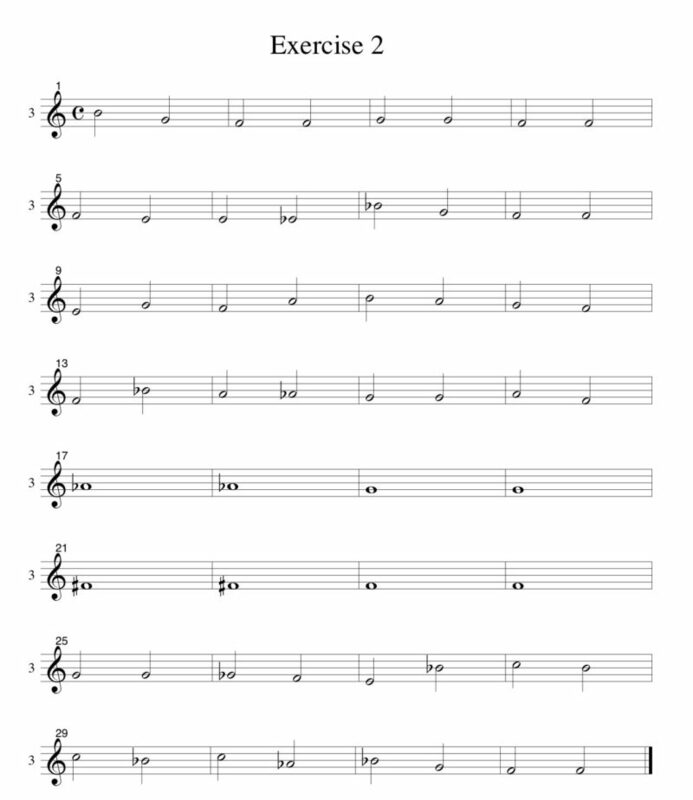 There are additional exercises presented in the book like singing all the voices for each harmony linearly. This can really help develop the ability to hear complex chord progessions with a key center. This course also develops you key retention skills which is prerequisite to many of the more challenging courses within this ear training method. Multiple types of MP3s that get right to the heart of students problems such as key retention, staying on pitch and holding onto your part when other voices are present. Each part of the four part exercise can be heard by itself or with any combination of the other voices. Multiple tempos are included with many of the MP3s so that you can develop your skills to a high level but also to help you hear the whole exercise in one key center. In a nutshell, whatever exercise you decide to start with in this book it is recommend that you practice it up to 5X a day for 5 to 10 minutes. 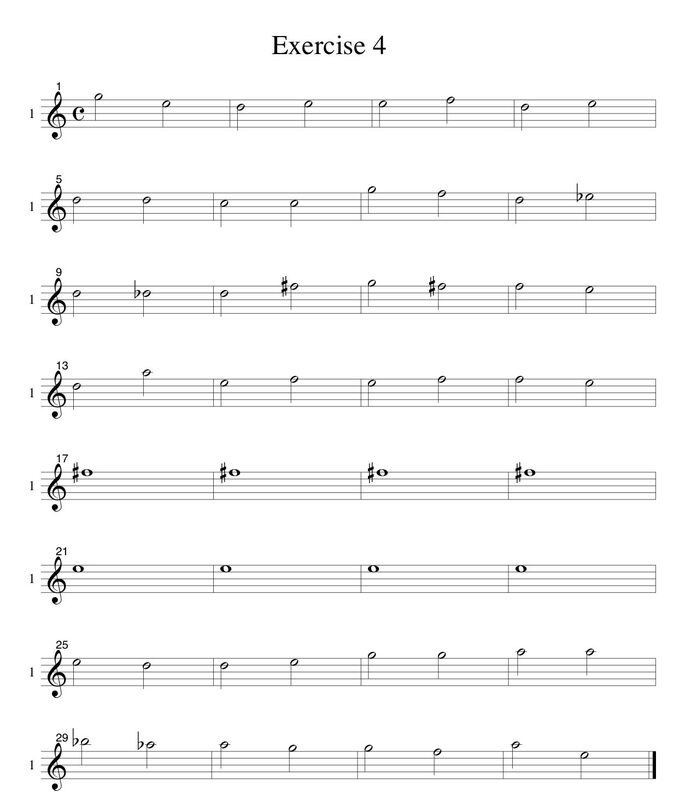 This will help you memorize the sound of each note within a key center which is the basis of this type of ear training. So with a short amount of practice time you can really make a difference in your ability over time. This book will work for soprano, alto, tenor or bass singers i.e., SATB so everyone can use this method. Sing through each of the four single melody lines that make up the SATB. Use the MP3s or midfiile with an accompanying drone. 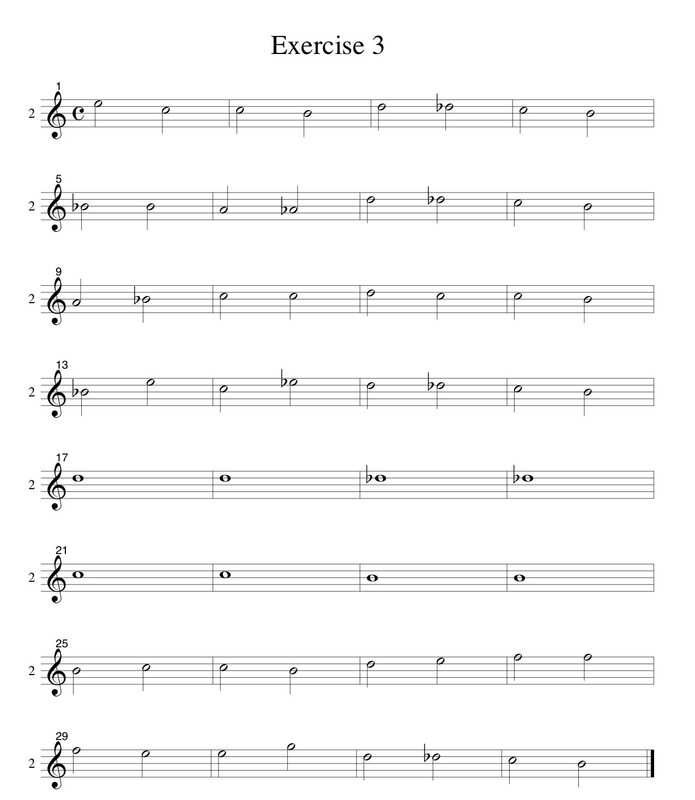 Sing through each part of the two part harmony exercises. Sing with all three other voices playing. 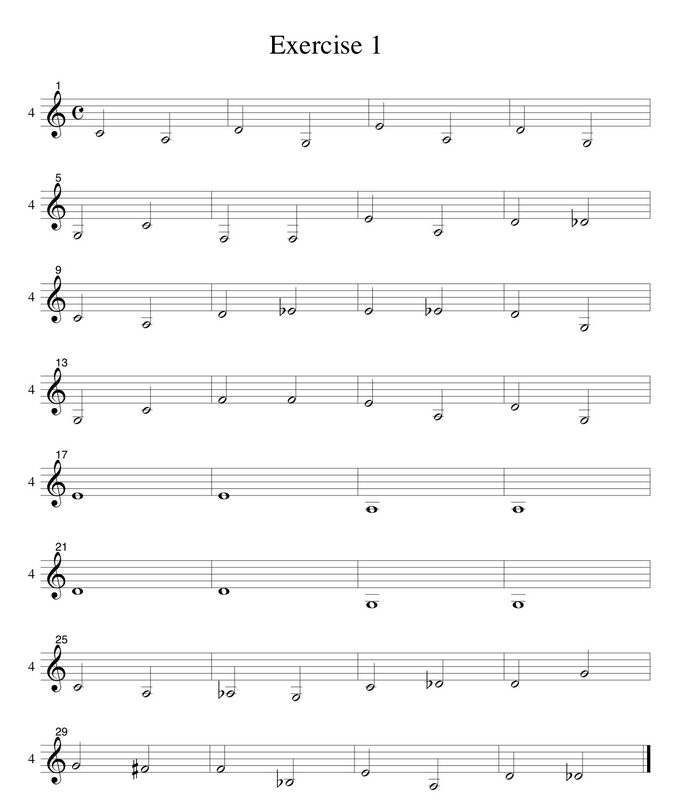 It’s important that you hear the entire melody of each exercise in one key center. This can be difficult when the tempo is slower. I’ve included files with a drone of the key center. This will help in those situations where you tend to erroneously modulate. Midifiles are included if you want to work in a different tempo. A persons ability to sing with a harmony. Your ability to hear inner voicings within four part harmony. Click on Triangle to see Score. Please note some multiple parts use just the 4 part SATB Score. Click on Triangle to see Score. These MP3s play all four parts but have one voice louder than the others. A One measure drone first establishes the key center. Singing Harmony with Four Voices but with One Voice Emphasis. This is a new ear training and sight singing book which takes a different approach by utilizing single line and part singing; where one voice is played while another is sung. With all the MP3s that are avaialbe every situation is covered so you can develop your singing skills in many ways. 13 Page PDF showing the chords with chord symbols that are played for each example. I sing in my church choir and this book has made one of the top singers in the group. Amazingly simple yet effective use of MP3s! The MP3s highlight a single voice which allows me to hear my part and then when I have it down I can sing along with the four parts where I blend in. 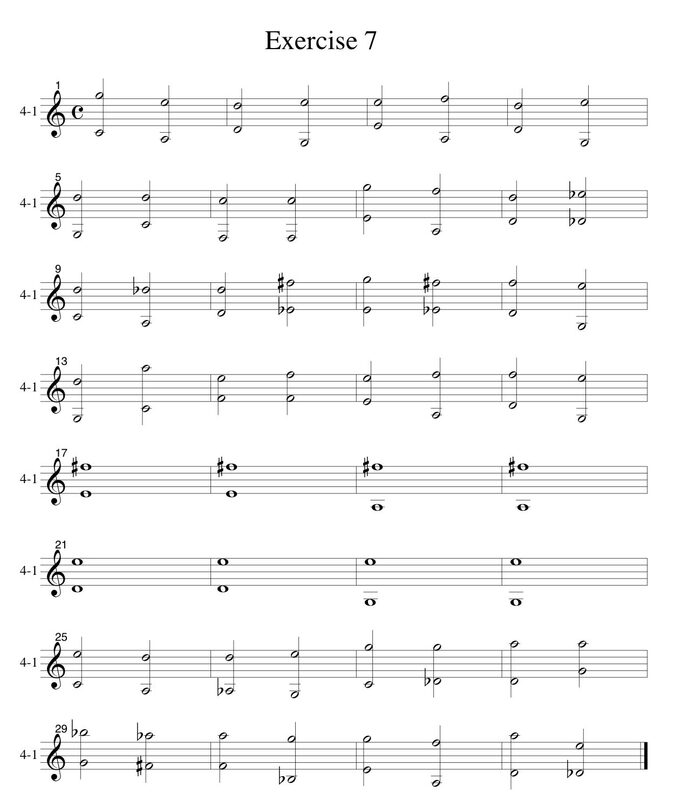 It really helped me isolate melodies within a 4 part harmony and work on hearing them in the key center. Before I found muse-eek.com’s ear training I was trying to sing note to note and gauge the distance between notes. What a nightmare! I was singing off key and it was really hard to master my part. I’ve been working with Ear Training One Note Complete and Contextual Ear Training and now the “Lines Choral Ear Training Studies SATB” book and this combination has been great! I really feel like I’m finally getting somewhere with my singing. T. Anderson. I’m a jazz singer and found these versions of “Rhythm Changes” to be super useful. Plus they give interesting harmonic palettes for each example. Some are highly challenging and really give me a lot of ideas for improvising melodies over “Rhythm Changes” which is great because those chord changes apply to so many jazz and contemporary tunes. D. Henry. I’ve really enjoyed working through the examples in the book. It’s great to be able to concentrate on one part and then add in other parts at will. The MP3s are a godsend I can pick and choose with of the four parts to have playing. I can have my part play or not. This is a great idea to develop part singing. Love it. T. Schein. 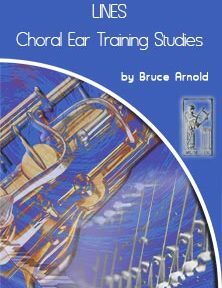 Get “Lines Choral Ear Training Studies SATB” today and improve your ear training and sight singing skills! 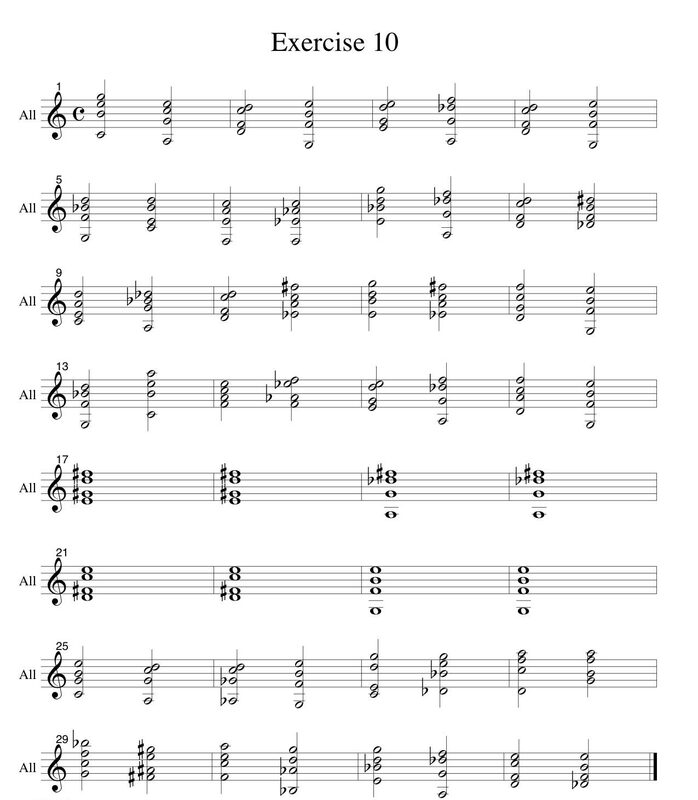 What should I work on after “Lines Choral Ear Training Studies SATB” Exercises? Please contact Bruce for additional ear training exercises..